Remember Beaker? 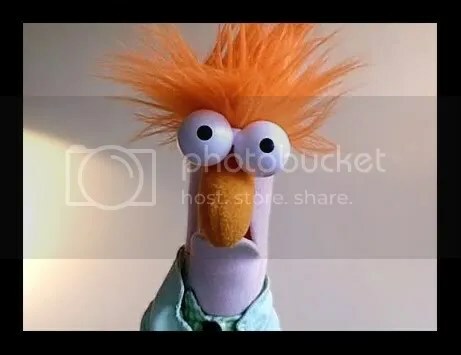 Beaker was the frazzled assistant of Dr. Bunsen Honeydew on The Muppet Show. If you’re familiar with the character, you’ll know that, aside from the mop of orange hair and the wildly staring eyes, one of his main discerning attributes was his manner of speech. If you can even call it speech. . .
Beaker communicated in an often-frantic series of ‘meeps.’ As it became obvious to the audience (and to Beaker) that Dr. Bunsen’s latest experiment was destined to go awry (and more than likely cause harm to the poor little Beak-man), his meeps would become increasingly agitated and insistent. If you don’t remember him, go watch at least the first 3 seconds of this video. I’ll wait. . .
Why am I babbling about Beaker, you ask? Because I suspect that my daughter is somehow related to him. You wouldn’t know it to look at her, she hasn’t inherited the bulbous orange nose, the unruly hair, or the bulging eyes that he is so known for – but what she does have seals the deal, fer sure. She does. And we’re all just a little bit worried about her. . . I’m not talking about a cute and innocent little ‘meep’ here and there – that would be tolerable. No. What Tea-ball does sounds more like Beaker facing his worst nightmare in person. It isn’t cute. And it must be stopped! Because, you see, when T gets upset, angry, or just plain overtired – EVERY. LITTLE. THING. is the absolute end of the universe. It is at this point that her speech degrades. After much research into the matter, we’ve come up with a theory on this. It is our studied hypothesis that this inevitable language breakdown occurs because her brain, in fact, has stopped working entirely. It completely shuts down. And THAT is when the meeping takes over. Beaking - "DO NOT go in her room - she's in there Beaking"
Beaked out - "She Beaked out on me when it was time to go"
Beak attack - "I don't want to deal with another Beak attack"
Gone/Going Beaker - "I give up! T's gone/going Beaker again"
Beaks - "If T Beaks about it, you're dealing with her"
I’m serious, people. This is a problem. And it’s getting worse. Though a series of experiments, we’ve figured out that the ‘meeps’ actually are some rudimentary attempt at communication. Unfortunately, we have yet to discern exactly what it is that she is trying to say. Asking her to calm down, slow down and repeat herself, haphazardly guessing, or begging her to PLEASE SPEAK ENGLISH only results in a series of increasingly frenzied (and often tearful) ‘meeps.’ Meeping back has gotten us nowhere. Is this an illness? A sickness of the mind, perhaps? Will antibiotics help? Antivirals? Psychiatry? Brain surgery? We just don’t know. In spite of our desperate searching, we have yet to uncover any evidence that can point us to either a diagnosis or a cure. Please, if you know anything about this condition. . .
*giggle* I think you are hilarious!! Don’t you know that 2 year olds find “beaking” FUN?! I swear, it must be true because my little ones do it too. I have yet to catch it on video, but sometimes…they just crack me up. Yeah, I know it’s not funny, but sometimes their hysterics over absolutely nothing is quite entertaining! Funny!! (laughing!) You may never know what she’s saying! She meows!?? Hysterical! I wonder what our silly two’s would do if we were able to get them together!!? LMAO– “If T Beaks about it, you’re dealing with her” is my favorite. I like how you did a little urbandictionary thing for her beaking, a Use-Beaker-in-a-sentence kind of thing.